One of the great restorers of letters in Europe, and one of the most elegant of modern Latin authors, was born in 1466 or 1467 in Rotterdam as Gerrit Gerritszoon, he was also known as Gerard Didier, and took the name of Erasmus, Desiderius Erasmus of Rotterdam. To profound learning he joined a refined taste and a delicate wit, and few men have been so greatly admired as he was during his lifetime. The principal sovereigns of Europe endeavored to draw him into their kingdoms. Erasmus visited several times England, where he was received with great deference by Henry VIII, and where he gave lectures on Greek literature at Cambridge. He made many translations from Greek authors, and a very valuable translation of the New Testament into Latin. His writings introduced the spirit of free inquiry on all subjects, and to his influence may be attributed the first dawning of the Reformation. But his caution offended some of the best men of the times. His treatise on "Free Will" made an open breach between him and Luther, whose opinions favored predestination; his "Colloquies" gave great offense to the Catholics; and as he had not declared for the Protestants, he had but lukewarm friends in either party. It has been said of Erasmus, that he would have purified and repaired the venerable fabric of the church, with a light and cautious touch, fearful lest learning, virtue, and religion should be buried in its fall, while Luther struck at the tottering ruin with a bold and reckless hand, confident that a new and more beautiful temple would rise from its ruins. 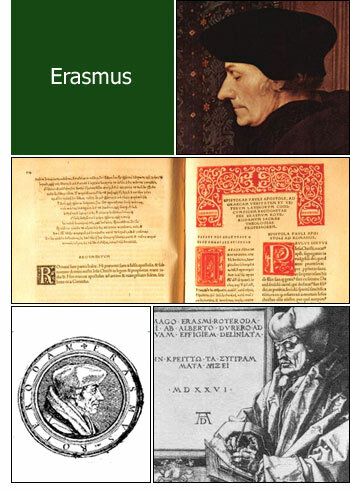 Erasmus died on July 12, 1536.